When Lila Bennett and David Robb set out to buy a farm in central Vermont, they had to get used to disappointment: Multiple land deals fell through at the last minute, and cash-bearing buyers outbid the husband-and-wife team on several occasions. "We had a lot of heartbreaking near misses," said Bennett. In the meantime, they patched together their business, Tangletown Farm, on parcels of leased land in and around Middlesex. At one point, they were driving between five separate locations to tend their pastured poultry and pigs; their cows were "gypsies," said Bennett, shuttling over the course of a few years between East Montpelier, Williston and Craftsbury. Young farmers, tight finances and demand for land are nothing new in Vermont ag circles. The problem persists across the state but is especially keen in areas where development pressures and high land values conspire to make farmland almost impossible for young farmers to acquire. So Bennett and Robb looked to Vermont's Northeast Kingdom, the corner of the state made up of Essex, Orleans and Caledonia counties. Amid its own agricultural renaissance, the region — which has the state's highest poverty rate — still has some affordable farmland. "This is a part of the state that historically had a lot of farms, has farmers aging out, and does not have the same kind of development pressures that places like the Champlain Valley [have]," said Sarah Waring, who directs the Center for an Agricultural Economy in Hardwick. "It's gorgeous in a rugged way," said Waring, but you're more likely to have a trailer park for a neighbor than a manicured country estate. Ag land typically goes for between $3,000 and $4,000 an acre in the Northeast Kingdom, before development rights have been sold, according to a local real estate agent who specializes in farm transactions. Selling those rights to a conservation agency like the Vermont Land Trust brings the cost down to as low as $900 or $1,000 an acre. Jon Ramsay, who directs the VLT's farmland access program, says per-acre rates can be much more expensive elsewhere in the state, particularly southern Vermont: as much as $8,000 an acre with development rights; up to $3,200 without. VLT maintains a list of farmers hunting for land. Right now, it's about 275 names long. Those farmers who are willing to consider the Kingdom have to contend with complications — not the least of which is a longer, colder winter. "We really didn't think that we would be able to be successful moving this far away," said Bennett. She and Robb both grew up in central Vermont, and the Northeast Kingdom — which even they viewed as remote — was a long drive from their family, friends and faithful customers at the Montpelier farmers' market. They were reluctant until, with the help of Derby-based real estate agent Dan Maclure, they stumbled upon a property in West Glover. Through the VLT, the couple was able to afford the farm and guarantee its conservation as ag land. In December 2012, Bennett and Robb closed on 188 acres, an old tie-stall barn and a farmhouse set atop a high, windswept hillside. Bennett and Robb weren't the only ones looking. Maclure is helping some out-of-state buyers, too: farmers from Ohio and Pennsylvania who want to move to a more rural location with a slower pace; would-be buyers from the West, worried about drought and changing weather patterns. It's not just low prices luring new farmers to the region, say ag experts in the Northeast Kingdom: The region is home to a robust, growing food-systems network that supports farmers. That's due in part to a federal designation that marks Essex, Orleans and Caledonia counties collectively as a Rural Economic Area Partnership zone. One of only five in the country, the REAP zone has brought the region nearly $68 million over 14 years in the form of business grants and loans for community programs and housing. Much of that money has been invested in agricultural enterprises, such as the Vermont Food Venture Center in Hardwick. Earlier this month, the U.S. Department of Agriculture announced that another $2.3 million was headed to the Northeast Kingdom; grant recipients included the Center for an Agricultural Economy and Green Mountain Farm-to-School. Waring, with the ag economy center, said the importance of the designation can't be overstated. That $2.3 million "would have been something like $150,000" if it wasn't in the zone, Waring said. "I think that there is absolutely momentum here in the Kingdom," said Katherine Sims, founder and director of Newport-based Green Mountain Farm-to-School. The organization acts as a broker between farmers, predominantly in the Northeast Kingdom, and institutions such as schools, prisons and senior centers. Last year, the organization bought food valued at nearly $340,000 from more than 40 farmers and food producers, and distributed it among 115 big buyers. The Kingdom is also home to a first wave of ag entrepreneurs who, one or two decades into building their businesses, are recruiting and reassuring newcomers. In fact, Bennett said that one of the region's trailblazers — Pete Johnson of Pete's Greens — helped convince the family to move north. When rent shot up on a parcel of farmland Bennett and Robb were leasing in central Vermont, Johnson let the couple pasture their cows on some of his property. During their first year in the Kingdom, they partnered with Pete's Greens to distribute their meat and eggs to markets in Burlington and Montpelier. Tangletown Farm is on a dirt road in West Glover. On either end of it are families who have worked their land for decades. "The community is wonderful," Bennett said on a recent tour of her farm. That mix of old farm families and newcomers is part of what appealed to Paul Lisai, a dairyman who closed on his own farm — 2.5 miles from Tangletown — this year with the help of the VLT. "Where I grew up in southern Vermont, all the farmers were kind of gone, in a way," said Lisai. He came to the Northeast Kingdom 12 years ago, and ended up working for a number of farmers in the region. When he started his own business, fellow farmers would give him cows or let him borrow equipment. He said the region's dairy farming tradition made all the difference when he set out to start his own. His Sweet Rowen Farmstead bottles milk and makes fresh cheeses, which Lisai sells within a 100-mile radius of the farm. Fall's brisk cold was already gripping Tangletown Farm last Thursday; the first hard frost had come and gone. Bennett and Robb's three children — Sam, 12, Governor, 9, and Willa, 7 — tinkered with a bicycle in one of two barns. The family's move to West Glover allowed them to expand, rapidly. Six years ago, Bennett and Robb raised 200 chickens for meat, 20 pigs, two steers, 25 rabbits and 50 turkeys. This year, they put more than 10,000 chickens on pasture. Their herd of cows is 30-strong. They tend a flock of roughly 900 laying hens, and sell 400 dozen eggs a week. In the other barn, Olivia the sow grunted from a pile of hay while days-old piglets suckled at her teats. Bennett pointed out the two large flocks of laying hens and paused to give a black Angus a gentle pat. Five donkeys — the children's favorite animals on the farm — roamed free; at night, they bed down near the chickens to ward off predators. Later that day, Tangletown Farm would receive its last batch of chicks for the year. After three weeks or so under brooder lights in one of the barns, they'd head out to pasture. The farmers wait until the birds reach seven or eight weeks, then process them in the mobile slaughterhouse Bennett and Robb purchased from the State of Vermont nearly three years ago. The USDA-inspected birds head out to restaurants, CSA customers and markets in northern Vermont. Sitting at the kitchen table in the West Glover farmhouse that the family has occupied for nearly two years, Bennett said she never expected to land on 188 acres, let alone to be raising as many animals as she and Robb now tend. In fact, both were vegetarians at one point in their lives. The farmers hold strong convictions about how their animals should be raised: on pasture, with plenty of space to roam, graze and forage. Bennett recalled having strong, knee-jerk reactions about "big" farms; she worried size would mean tradeoffs in the care of the animals. 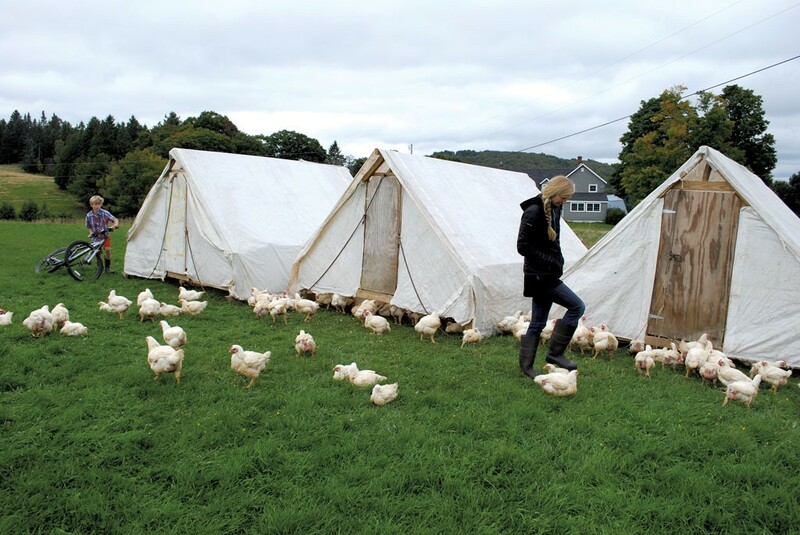 "People like the idea of the small, diversified farm with a couple of hens," said Bennett. She was one of them. But eventually she realized, "That's not going to feed the farmer." In West Glover, with a view of the slowly turning Sheffield wind turbines to the east, Bennett and Robb are figuring out how to farm the way they want to farm — and still make a living. The price of land makes all the difference. As Bennett pointed out, "We realized we can afford to move here and farm." The original print version of this article was headlined "Go Northeast, Young Farmer: Entrepreneurs Take Root In Vermont's Remotest Reaches"